Featuring a fierce exterior design inspired by military weapons, the Cooler Master Storm Scout computer case really gives you a look you can appreciate, and your opponents can fear! The Storm Scout can accommodate massive storage, with five 5.25" and six 3.5" drive bays (five hidden and one external). 3 fans provide excellent cooling, including one 120mm red LED rear fan, one 140mm top fan and one 140mm red LED front fan. The stealth control panel easily controls LED on/off for tuning your lights and fan speed. The storm guard’s security locking bracket in the chassis protects your external devices and neatens the cables, and you can quickly upgrade and maintain your computer case with the Scout's screw-less design. It’s a great case for the do-it-yourselfer who needs a lot of flexibility! Easy USB, e-SATA and audio connectivity is provided on the top I/O panel. Reinforced carrying handles makes it easy for fast and efficient mobilization. While you want a case that both satisfied you with its appearance and performance, the Scout is the best choice for you! Superior Expandability with 10 Drive Bays Boasting five 5.25" external drive bays (one can be converted to 3.5"), and five 3.5” internal drive bays, the Cooler Master Storm Scout provides expandability for future upgrade. Unprecedented Airflow The Cooler Master Storm Scout features one 140mm top fan and two 120mm red LED fans – one in the front and one at the rear, creating heavy duty airflow to cool down even the most extreme gaming system. Tool-free Installation The tool-free design ensures quick installation and upgrade for expansion cards, 5.25" and 3.5" devices to save your time. Start enjoying computing rapidly! Convenient Top I/O Panel The convenient top I/O panel enables easy access to four USB 2.0 ports, one eSATA port and two audio ports as well as a stealth panel for tuning your lights. 19.20" x 8.60" x 19.50"
Fierce exterior design inspired by military weapons. Reinforced carrying handles for fast and efficient mobilization. Menacing all black interior and window side panel for striking visuals. Stealth panel for tuning your lights. Solid Bridge included for full 2.5" SSD/HDD support! StormGuard - groundbreaking security system for safeguarding your gaming peripherals. Pros: will fit it all coolers and all HANDLES ON TOP ARE GREAT !! Cons: none I can find I really Liked it. STRONG BUILT WELL NOT CHEAPED OUT LIKE A LOT OF THEM AND DEFINITELY WORTH THE MONEY.. THIS IS A BUY BUY BUY IF STILL AVAILABLE. Other Thoughts: Yes I would recommend it to anyone with a brain !! Pros: Still working to this day, good airflow and the side panel fans mounts work very well to put even more into it. Had it about maybe a year or two and got it pre owned from a local shop. Cons: Nothing to report so far! Other Thoughts: I would definitely recommend this case, seeing how well it preforms. Pros: hand me down from my brother :P winner me ! Other Thoughts: CM just has to make white one and i will buy one for sure ! My brother purchased the case in 2011 it now 5 years olds but wow so silent so nice !! I will seriously never get rid of this case EVER !! 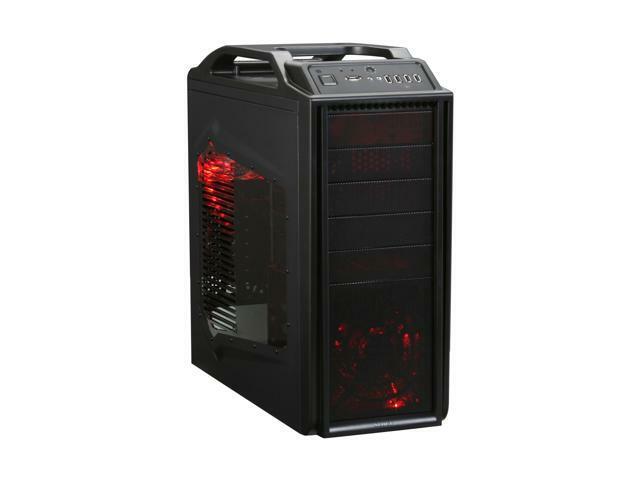 @newegg is this case discontinued or just out of stock ? Pros: bought this case in November of 2010 and there is rust, no broken parts and the screws all still have the dark color finish. Cons: looking to use closed circuit liquid cooling on next build, might be tight but I'll make it work. Other Thoughts: I can carry it because it has a handle! Cons: -Awkwardly shaped side panel budges can make it a tight squeeze in symmetrical spaces. Pros: Sharp looking case. Came with a nice bag of options to connect stuff. Cons: None I can think of. It's big but that is what I wanted. Other Thoughts: Old and still going strong. Happy I bought it. Cool lights that still work today. I would buy CM cases again! Pros: good steel construction, I like the power/reset buttons being at the top of the case so they are easy to get to. It has a good airflow to it as well. Cons: it weighs about 25 pounds. Pros: Solid - The case is super sturdy. The handle is a nice convenience for when/if you carry your computer around to LAN parties and such. The handle itself feel really strong as well. No worries about it breaking or anything. Looks- This case has really nice aesthetics. When the LEDs work, you get a really nice red look with the monolithic structure of the case. Ease of Use/Install- Compared to some of the other reviews on here, I had a really easy install with this case. The box came with a decent amount of spare parts. Cons: Faulty LEDs- This is mentioned in some other reviews I've read. This case came with a few fans with LEDs attached but I've never gotten the front fans LEDs to work and the other ones only work intermittently. Front Punch Outs- The front punch outs aren't too easy to cleanly seperate. Installing a DVD Drive in the top slot, I had to take the top punch out off and ended up taking the second and third out. Other Thoughts: I guess a con for this case is that it doesn't have USB 3.0 ports on the front, but considering this is a 4 year old case I didn't list it there. It's a pretty solid case. Reviewing this case almost 4 years later makes me realize that styles have changed a lot since then. I'm itching for a more minimalist style case. I'd rather have a a simple looking case showcasing in the guts of a build with a nice window rather than the case itself.